Our new book, "3D Printing with MatterControl" is expected out this week, just in time for New York Makerfaire. It will be available shortly after that in the MatterHackers store, on Apress' site and on the usual major online booksellers. When Rich Cameron and I teamed up on the earlier book Mastering 3D Printing a year ago there were very few screen shots and a lot of general direction on how to think about 3D printing and where to get the latest info. 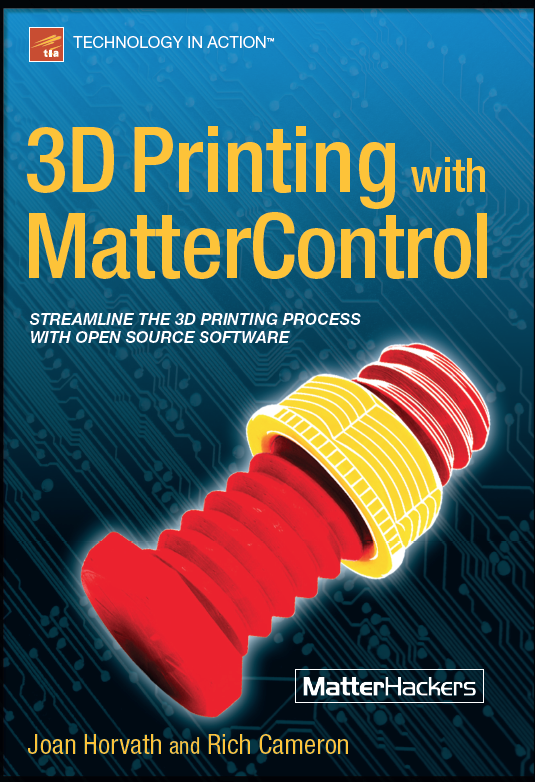 Now that MatterControl has emerged as an open source standard, it was cool to write the first book focused on it. We can now provide detailed instruction for both beginner and advanced features. We appreciate all our friends at MatterHackers who provided great advice and support (not to mention the software.) It is amazing to see how much 3D printing has evolved in one short year. We are tentatively scheduled to be at the MatterHackers booth at Makerfaire New York Saturday/Sunday the 26/27 at 1 PM each day, and at the Apress both at 2 PM both days. We will post updates if that changes.